Time for a Tuesday Tip! You always hear that green tea is amazing to drink & I actually do try and drink at least a cup or two most days. Recently I was having a frustrated-at-my-irritated-skin-day & was about to make myself a cup of tea to drink when I thought, “hey wait, if green tea is so good for my insides, why not just put it on my face?” Yeah. So, I decided to experiment! 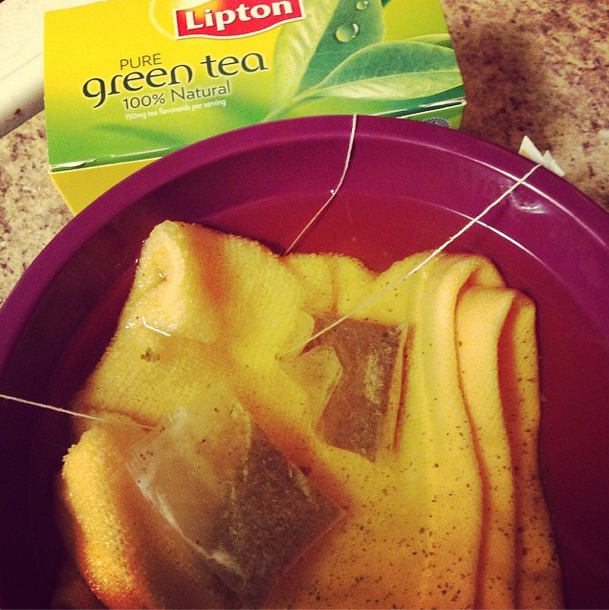 I put three teabags in a bowl with hot water & a washcloth. Let them steep for a while, then ring out the cloth & lay it over your face. I let it sit there for a couple minutes, until the cloth wasn’t warm anymore, then you can dunk the cloth again & repeat till your heart’s content. This actually soothed my skin so much & just felt really calming. I’m thinking of making this antioxidant soak a weekly occurrence, to see if there are any longer-term skin benefits. So, if you need a quick SOS treatment for irritated or angry skin, give this a go! Green tea is a guaranteed natural way to benefit your body, so you really have nothing to lose.